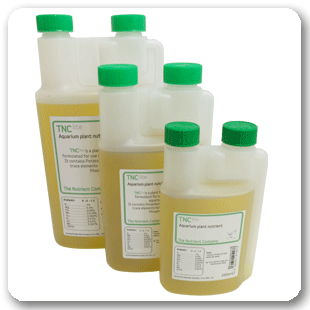 TNClite is Nitrate and Phosphate free. It is specifically designed for use in lightly planted aquariums and for aquariums with a high fish population. TNClite contains Potassium, Magnesium and Trace elements. The essential Nitrate and Phosphates will be provided by your fish and feeding regime. Encourages vigorous growth with strong healthy plants, which inturn greatly reduces the risk of algae. Can be used in conjunction with TNC Plugs which provide nutrients directly to the root zone. Suitable for beginners or more experienced aquascapers. If plants show signs of nutrient deficiency, increase dose or use TNC Complete. 1% K, 0.4% Mg, 0.08% Fe, 0.018% Mn, 0.002% Cu, 0.01% B, 0.01% Zn, 0.001% Mo, EDTA.